Liver diseases consist a growing health problem and one of the most serious causes of death worldwide. Liver transplantation is an established and successful procedure that represents the only gold standard therapy for a wide variety of liver diseases refractory to medical treatment. Despite its therapeutic potential, it remains a non-specific approach that is limited by donor organ shortage and a lifelong immunosuppressive therapy with its specific risks. Recently, liver cell therapy has focused on the hepatoprotective potential of stem cells via restoration of normal function, after tissue injury and regulation of the inflammatory processes in preclinical disease models. 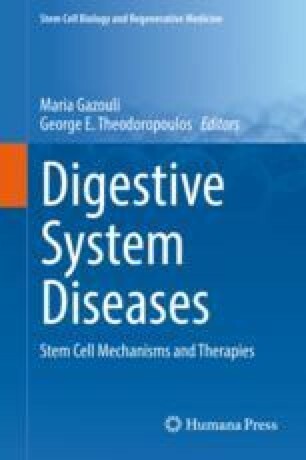 This chapter provides a description of the current issues on stem cell-based regenerative opportunities for liver diseases. In more detail, there will be discussed thoroughly the different stem cell sources and their clinical applications in in vivo rodent models and in patients with liver failure. Wang F-S. Umbilical cord mesenchymal stem cells for patients with autoimmune hepatitis. 2013. https://clinicaltrials.gov/ct2/show/NCT01661842.